The Qualification System for the Games of the XXXII Olympiad Tokyo 2020 sets out the qualification system for each of the ten Olympic Sailing events and the 350 athletes. There are 19 nation quota places in the 470 Men and 21 in the 470 Women, of which one quota place in each event is automatically awarded to Japan as host nation. In order to accommodate the IOC reduction in athletes in sailing, from Rio 2016 (380 athletes) compared to Tokyo (350 athletes) and achieve gender equity in the total number of men/women competing across the ten Olympic Sailing events, World Sailing was forced to make cuts in quotas to some events. The 470 Men was reduced from 26 places in Rio 2016 to 19 places in Tokyo 2020, whilst the 470 Women was increased by one place, up to 21 quota places in Tokyo 2020 compared to 20 places in Rio 2016. Years of campaigning are now coming down to the crunch. You may be amongst the best sailors in the world, but with so few places on offer at the Olympics, not all nations can be represented. The challenge to qualify is intense, being ready and prepared is key. The next opportunity to qualify is the 2019 470 World Championships in Enoshima, Japan, 2-9 August, where teams from around the world will battle it out on the same waters which will host the Olympic Sailing Competition. Here, 4 quota places are up for grabs in the 470 Men and 6 in the 470 Women. 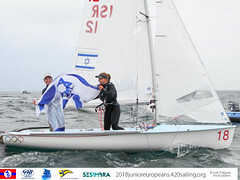 Nation quota places will be awarded to the best placed nations not already qualified from the 2018 Hempel Sailing World Championships, so there are going to be plenty in the mix. 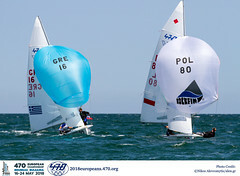 Scheduled from 2-9 August 2019, the timing of the 470 Worlds will allow teams who are competing on the international circuit to subsequently compete at the 2019 Olympic Test Event (17-22 August 2019) and the Enoshima World Cup (25 August-1 September 2019). Don’t miss the shipping package put together by GAC Pindar which offers shipping direct from the 2019 470 Europeans in Sanremo, Italy, to the 470 Worlds in Enoshima. Click here to find out more. 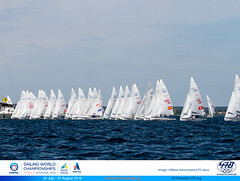 After the 2019 470 Worlds, the focus moves to Continental Qualification, which guarantees a quota place to each of the six continents. Continental Qualification kicks off in Asia, where Shenzhen in China will host the 2019 470 Asian Championship from 16-21 December 2019, with 1 quota place available in the 470 Men and 1 in the 470 Women. South America - 2020 South American Championship, Mar del Plata, Argentina, 11-17 February 2020. Based on current Tokyo 2020 campaign indications, and including the nations who may not regularly compete in the international circuit but are expected to contend the Continental Olympic Qualification, overall there will around 36 nations targeting qualification in the 470 Men and 32 in the 470 Women. Critically, if for any reason a qualified nation is unable to take up their quota place, then that place will be reallocated to the next highest placed nation who is not yet qualified, based on the results of the 2019 470 World Championships. Securing your nation's place at the Tokyo 2020 Olympic Games is just one part of the multi-faceted campaign, next step is for a team to secure the place as their nation representative. There is no let-up, as teams seek to qualify their nation and strive to meet their own national selection criteria for Tokyo 2020. Shall have appeared on the official World Sailing World Ranking List at any time between 1 January 2018 and 1 June 2020. Shall have competed in at least one of the Olympic Qualification Events. Click Here to see the complete list of qualification events for each of the ten events for the Tokyo 202 Olympic Sailing Competition. Click Here to check the World Sailing MNAs by Continent for the purposes of qualification to the Tokyo 2020 Olympic Sailing Competition. Click Here to check the nations qualified so far in each of the ten Olympic events.